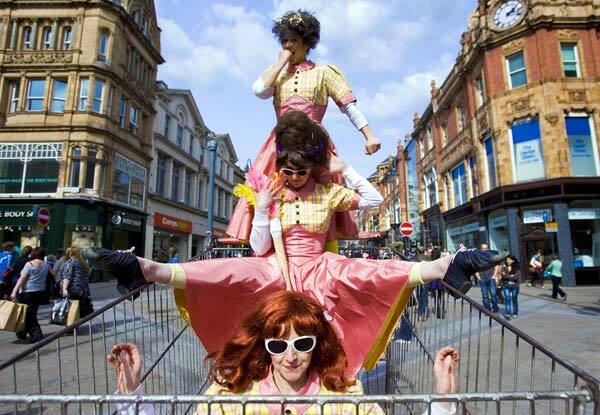 This quirky trio combine static and promenade performance as they process in their giant shopping trolley. Posing for photographs evolves into indulgent acrobalance, and extravagant shopping. The Gals, in their big gingham “frocks” and HUGE wigs, involve the audience in their exuberant balancing antics and their penchant for dusting and marshmallows. Bo Peep (on stilts) struggles to control confused soporific “Huggy Bear”, and “Tink”, the naughtiest fairy in Toyland. Transported in their giant shopping trolley – this is Christmas shopping at its most appealing. A fantastic great act for the Christmas season – ideal for shopping centres and fantastic in parades.